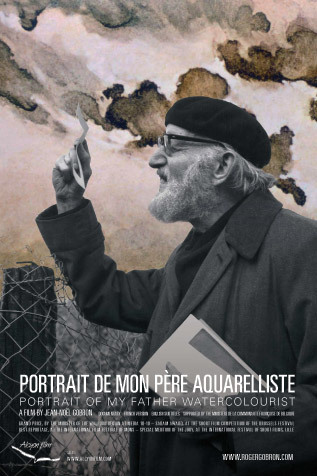 The film Portrait de mon père aquarelliste, directed by the son of Roger Gobron, is available on DVD. This DVD includes also a film about the poet Marie-Jo Gobron, who was the painter's wife. The house where Roger Gobron lived and worked with his spouse can still be visited in Bruges, at least the groundfloor, where Li and Lieven opened Li O Lait, a cozy coffea and tea bar. The address : Dweersstraat 30 at 8000 Bruges - tel. 050/70 85 70. Detail of the front facade with the memorial stone, handmade by Kristoffel Boudens. Three works of Roger Gobron, have been selected for the collection of the "Musée gaumais de Virton" (in 2004, a retrospective exhibition on Gobron was organized at the museum). The works are named Coin à Virton (here above), Eglise de Gérouville and Clin d'oeil dans la Nuit. 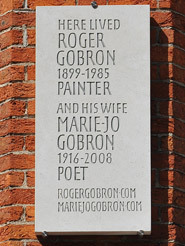 This is the official site of the Belgian painter Roger Gobron (1899-1985). 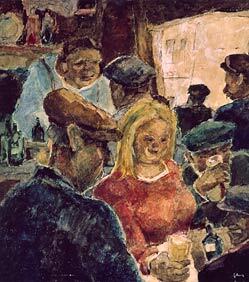 For nearly 70 years, Gobron painted almost exclusively with watercolour. At first, he used watercolour in a classical way, but his art, style and technique changed radically when he came in contact with the Flemish expressionists. Gobron is most probably the only painter in the world who experimented in this way, for his entire life, with the medium. He thus altered the aspect of watercolour, giving it the dimension, durability and value of oil painting. Home: the left column of this page will keep you informed about the latest news about exhibitions, publications, and events about the artist. Biography: provides you with an illustrated biography of the painter. Gallery: contains a chronological selection of the painters' work. Monograph: informs you about the book, that contains the complete catalogue of the more than 3200 works, which Roger Gobron produced during his life. Film/DVD: informs you about a 16 mm documentary, directed by the painter's son, which is available on DVD. Downloads: here you will be able to download photographs of the artist, illustrations of his work, essays, biographies, press articles, etc. Links: to the sites of the poet-novelist Marie-Jo Gobron, the painter's wife, and to Alcyon Film, which produced the film and published the monography, among other art related sites. Contact: amateurs, art collectors, curators and journalists, who are in need of more information will find here how to contact us. Language: goes back to the very first page of this web site, where you can choose your preferred language. Please don't forget to sign or consult our Guestbook.